June 6, 2014 Nefer Khepri, Ph. D.
Adversity occurs for good reasons. You may not believe that, but it’s very true. Sometimes there are very powerful lessons in adversity. Sometimes it comes as a blessing in disguise, which is what just happened to me. Bear Lake, Rocky Mountain National Park, near Estes Park, CO. (C) Nefer Khepri, 2013. When something bad happens to you & it is someone else’s fault, a natural first reaction is to become angry. Friday night I was mad as hell. We were rear-ended by a drunk driver. At the time, it didn’t seem like a huge deal. We were stopped at a light after having just pulled out of my favorite restaurant, Red Lobster after a lovely dinner without our teenage daughter, who was at a banquet for her school choir. Sitting at the light I had my head turned as I was speaking to my husband who was driving. I have a chronic ringing/whining in my left ear so in the car I have to sometimes nearly face him in order to hear what he’s saying. This was one of those times. A Dodge Ram 1500 pickup pulled up behind us. Just then the light turned green. There were 2 cars in front of ours so we couldn’t move, but the guy behind us saw green and hit the gas. My body jerked forward & backward several times while I was still turned to my left. I managed to straighten myself out & we all pulled over, got out of our cars & assessed the damage. Since it was very low impact there was no visible damage to either vehicle. The guy then admitted to being drunk “Sorry, folks. I’ve had a few”, and then drove off! Stuart had taken pictures of him, his truck and plates so I called the police to report it. About 10 minutes later I began to feel nauseated. That’s when I realized I had a problem. I went to bed in pain, woke up in even more pain that crawled from the back of my neck along the top of my right shoulder and festered in my shoulder blade and armpit area. Who knew your armpit could hurt so much?? I decided I needed to be looked at ASAP since this involved my neck so I went to a nearby Urgent Care center. He rolled his eyes at me. ROLLED. HIS. EYES. None of you ever knew my mother. One of the things I inherited from her was her MAJOR pet peeve about rolling one’s eyes at her. You did that & you just guaranteed yourself a swift slap in the face! I am my mother’s daughter. I didn’t slap the doctor, but I sure did tell him off at that point & said if he didn’t x-ray me immediately I’d be calling my lawyer. We don’t have a lawyer, but he got my point & told me to wait for the tech & stomped out of the room. The nurse came in & I broke down crying. She was so sweet. She held me & told me to let it all out & said that usually that doctor is very nice, but he had been having a bad day. I told her, “WHAT ABOUT ME?” I’m not the type to go to Urgent Care. I haven’t been in an ER for myself since I was 10 years old! I’m 50 now. She was very kind & understanding. She even brought me a can of orange soda. People do have bad days. I know I do. However, doctors in particular need to realize their patient is having a REAL bad day, especially if they are in pain. So I was angry at the drunk who had hit us and now also at the doctor. That was a lot to deal with on top of all the pain I was in, not to mention the nausea. He hung his head & did not reply, simply walked out. The tech returned & did my CT-scan. Thankfully, it showed a normal neck so the tech must have had me standing funny or something for the x-ray. My vertebrae were all in the correct placement so they said I had no structural damage. They tried to then charge me $25 for a CD of my CT scan, thus causing more anger & upset when I knew my insurance would be charged around $500 for it. I had to pay for one out-of-pocket 3 years ago so I am very aware of how much they cost. I told them they’d be making their money off my insurance, but they insisted they wanted that $25. The lovely nurse overheard the conversation & called me aside. She leaned over & whispered to me, “Give me 2 minutes. I’ll burn a copy & slip it to you.” I walked out with the CD hidden in a copy of Stephen King’s Duma Key that I had brought to read as I waited on them. By the way, if you’re a fan of his & haven’t read it yet, I’m about halfway through & so far it’s been pretty boring & not scary at all. Just FYI. The entire Urgent Care ordeal took four hours. I spent the rest of the day releasing my anger against the drunk driver and the doctor. It worked and by bedtime I went to sleep feeling much better from an emotional standpoint, but from the physical I was feeling pretty yucky. I spent all day in bed Sunday due to severe nausea that all seemed to feel like severe motion sickness to me. Adversity comes to us when we least expect it. That’s one of the things that makes us view adversity as being “bad.” It catches us by surprise & causes emotional upset, & sometimes physical as well, depending on the type of adversity we are facing at the time. Mine had been both emotional & physical, but I was over the emotional aspect, but had yet to really start dealing with the physical. 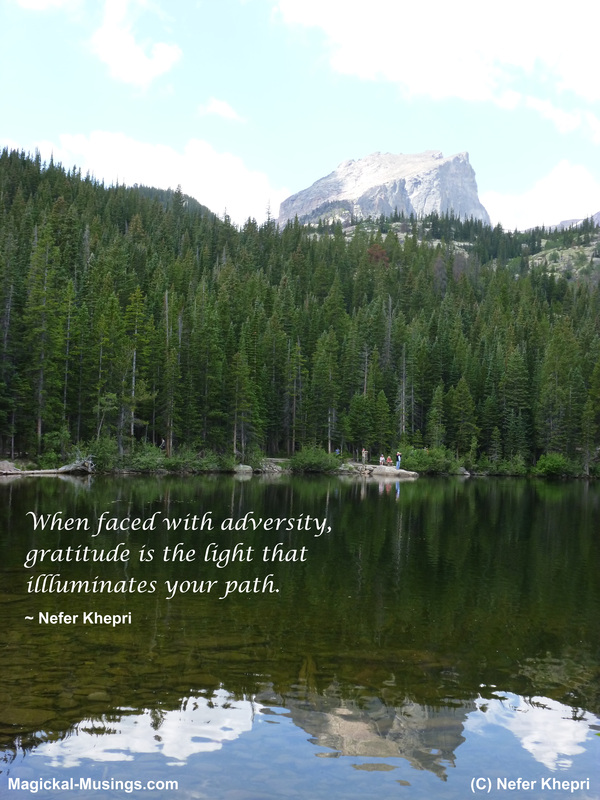 Adversity can also present us with hidden blessings. In most cases, adversity involves the learning of an important lesson. However, in my case, adversity lead to me receiving very valuable information about myself. Monday I made an appointment with an orthopedic surgeon. The Urgent Care nurse told me to do that while the doctor thought I was fine, naturally. I saw the ortho on Thursday (yesterday). He was quick, but thorough & really knew what he was doing. Plus, he had a decent bedside manner & apologized for the totally incompetent staff I had to deal with who made me fill out FOURTEEN forms while seated in a CHAIR. I had no table to lean on, no desk, & had to write with the clipboard propped up on my purse that was resting on my lap. When your neck and shoulder, and now upper back, are hurting that’s a very uncomfortable position to maintain. By the time I was finished (they never scanned my original forms I had filled in online so none was in their system so they needed hard copies! ), I was in so much pain I was starting to see double. So I gave them what-for as well before going into the exam room. In front of a waiting room filled with other patients too. One guy got up with an effort, came over and gave me a high-five. I wasn’t able to truly make the high-five, but did a pretty good approximation of one. Once in the exam room the nurse was very apologetic over what had occurred. I was nearly crying by then & once more very angry. I told her they must make accommodations for patients who are there alone without any help. They should have a stand to put the clipboard on so I can keep the forms at eye level, and if not, then someone should HOLD the darn thing in front of the patient or better yet, take the information verbally & fill the forms out for the patient. She agreed, but after the fact that made little difference to me. Bone spurs in my neck?? I had NO clue! My neck never cracked or hurt before the accident, but I do have an old shoulder injury from a fall that I know the accident has exacerbated. He said physical therapy will help with my neck & if I’m not better in a month he will also check for nerve damage. I told him about my shoulder & he was the first doctor to take me seriously about that. This is an old injury from 14 years ago. I was on the beach with my daughter who was 18 months old at the time. I was holding her when a wave came in that was much larger than it looked. It knocked me up into the air & my daughter & I went flying backward several feet. I landed with the full weight of my entire body on my right shoulder blade while my poor baby flew several feet behind me & narrowly missed hitting her head on a sharp rock by less than an inch. Thankfully, she was fine, I was not. Three doctors and three sets of x-rays later I had nothing to show for it except for what eventually became a chronic condition. The ortho told me I have a bad sprain and he said without treatment it is chronic. I also have slight muscle atrophy along the shoulder blade as well. He believes physical therapy will help and that eventually I won’t have muscle tightness or pain there. So, two good things came out of this adversity. One: I now know I have bone spurs in my neck that can be treated, hopefully without surgery pending my doctor seeing the x-rays from Urgent Care, which means I have to go back to that place to get them. Lovely. Two: a doctor FINALLY took me seriously about my shoulder and I will FINALLY be receiving help for it. Adversity can be a good thing. Despite all the pain & nausea, I’m actually kind of grateful that guy rear-ended us Friday night. If he had not, I would not discover I have bone spurs until probably years down the road when they would have been worse and may have required serious neck surgery. I’m also grateful because through this accident I have found a doctor who took my shoulder issue seriously enough to fully examine me for it & prescribe physical therapy. I have gratitude for what happened to me, even though it was “bad” & has resulted in a great deal of discomfort, not to mention the forthcoming medical bills once our insurance pays on it all. Yet, I am grateful. I have a daily practice of stating 3 things for which I am grateful that I began in my Facebook group, Magickal Musings ~ Spiritual Sharing & Gratitude. I invite you to start listing your daily gratefuls. Big, tiny, it doesn’t matter. All it takes is 3 things. Soon, your overall outlook on life will improve. Also, by maintaining a grateful heart we open the door wide for new blessings to start entering our lives. I have seen this happen in my life & members of my group will also attest to the same happening for them. We have proved the efficacy of listing your daily gratefuls time & time again. I invite you to join us there & if not, I hope you start expressing your daily gratitude in a journal or in prayer. I can honestly say that I am grateful we were rear-ended because it lead to new medical knowledge about myself that down the road has probably saved me from what may have been a great deal of suffering & lasting problems. Adversity can be a GOOD thing. When you are faced with adversity, please remember to try to look for the lesson in it, or even the hidden blessings. They will be there, I assure you. Next The Top 10 POSITIVE Things About Mercury Retrograde.